More and more jobs are becoming automated, meaning that machines can do certain tasks better than a person can. 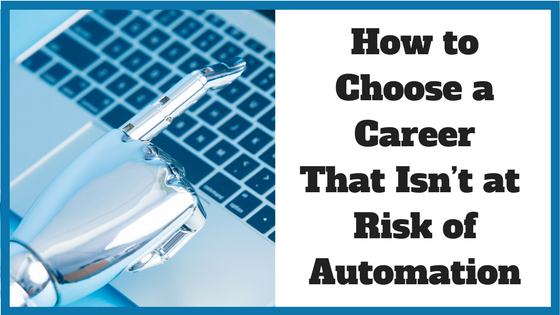 However, some careers are more at risk of automation than others. In order to avoid – as far as possible – the scenario of a robot taking your job, be mindful of this trend towards increased automation. If you really want job security, then take note of those jobs that are most at risk of automation, and those which are least likely to be carried out by a machine in the future. Researchers at Oxford University published a paper in 2013 that looked at the likelihood of different occupations becoming computerized. Read on to learn the jobs most at risk and those least likely to be taken over by bots. What all of these occupations have in common is that they involve repetitive, rule-bound activities. These are the kind of patterns that machines in the future could replicate through machine learning algorithms – computer programs that allow machines to learn automatically without human intervention. PwC recently analyzed over 200,000 jobs and highlighted that automation in the next two to three years will impact financial services the most. PwC chief economist John Hawksworth said a lot of these jobs are “relatively routine jobs such as data analysis,” particularly clerical occupations, “which make up a quarter [of financial jobs].” These roles can easily be automated with simple algorithms. What these occupations have in common is that they require a high level of human interaction. They are jobs that depend on traits such as empathy, wisdom and morality; traits that machines may never be able to adopt or which may take a lot more time to automate. While increased automation has some people worried about the prospect of mass unemployment in the future, and the economic losses this would entail, the future of work could be very much in our favour. Human skills could become complementary to artificial intelligence and end up actually benefiting the economy. Moreover, increased automation can free us from having to do jobs that are mundane and uninspiring. Instead, we can focus on tasks that are distinctly human, which involve skills such as creativity, communication, emotional intelligence and collaboration. Many of the jobs that are the least likely to be automated are those which working with people to improve their lives. In this respect, AI could give us the opportunity to choose careers that are more meaningful and, therefore, more satisfying.